The Intergovernmental Panel on Climate Change (IPCC) is an intergovernmental body of the United Nations, dedicated to providing the world with an objective, scientific view of climate change, its natural, political and economic impacts and risks, and possible response options. It was established in 1988 by the World Meteorological Organization (WMO) and the United Nations Environment Programme (UNEP), and later endorsed by the United Nations General Assembly. Membership is open to all members of the WMO and UN. The IPCC produces reports that contribute to the work of the United Nations Framework Convention on Climate Change (UNFCCC), the main international treaty on climate change. The objective of the UNFCCC is to "stabilize greenhouse gas concentrations in the atmosphere at a level that would prevent dangerous anthropogenic (human-induced) interference with the climate system". The IPCC's Fifth Assessment Report was a critical scientific input into the UNFCCC's Paris Agreement in 2015. IPCC reports cover the "scientific, technical and socio-economic information relevant to understanding the scientific basis of risk of human-induced climate change, its potential impacts and options for adaptation and mitigation." The IPCC does not carry out original research, nor does it monitor climate or related phenomena itself. Rather, it assesses published literature including peer-reviewed and non-peer-reviewed sources. However, the IPCC can be said to stimulate research in climate science. Chapters of IPCC reports often close with sections on limitations and knowledge or research gaps, and the announcement of an IPCC special report can catalyse research activity in that area. Thousands of scientists and other experts contribute on a voluntary basis to writing and reviewing reports, which are then reviewed by governments. IPCC reports contain a "Summary for Policymakers", which is subject to line-by-line approval by delegates from all participating governments. Typically, this involves the governments of more than 120 countries. The IPCC provides an internationally accepted authority on climate change, producing reports which have the agreement of leading climate scientists and the consensus of participating governments. The 2007 Nobel Peace Prize was shared, in equal parts, between the IPCC and Al Gore. Following the election of a new Bureau in 2015, the IPCC embarked on its sixth assessment cycle. Besides the Sixth Assessment Report, to be completed in 2022, the IPCC released the Special Report on Global Warming of 1.5 °C in October 2018, will release an update to its 2006 Guidelines for National Greenhouse Gas Inventories—the 2019 Refinement—in May 2019, and will deliver two further special reports in 2019: the Special Report on the Ocean and Cryosphere in a Changing Climate, and Climate Change and Land. This makes the sixth assessment cycle the most ambitious in the IPCC's 30-year history. The IPCC also decided to prepare a special report on cities and climate change in the seventh assessment cycle, and held a conference in March 2018 to stimulate research in this area. The IPCC developed from an international scientific body, the Advisory Group on Greenhouse Gases set up in 1985 by the International Council of Scientific Unions, the United Nations Environment Programme (UNEP), and the World Meteorological Organization (WMO) to provide recommendations based on current research. This small group of scientists lacked the resources to cover the increasingly complex interdisciplinary nature of climate science. The United States Environmental Protection Agency and State Department wanted an international convention to agree restrictions on greenhouse gases, and the conservative Reagan Administration was concerned about unrestrained influence from independent scientists or from United Nations bodies including UNEP and the WMO. The U.S. government was the main force in forming the IPCC as an autonomous intergovernmental body in which scientists took part both as experts on the science and as official representatives of their governments, to produce reports which had the firm backing of all the leading scientists worldwide researching the topic, and which then had to gain consensus agreement from every one of the participating governments. In this way, it was formed as a hybrid between a scientific body and an intergovernmental political organisation. The Intergovernmental Panel on Climate Change assesses peer-reviewed scientific literature and other relevant publications to provide information on the state of knowledge about climate change. It does not conduct its own original research. It produces comprehensive assessments, reports on special topics, and methodologies. The assessments build on previous reports, highlighting the latest knowledge. For example the wording of the reports from the first to the fifth assessment reflects the growing evidence for a changing climate caused by human activity. Korean economist Hoesung Lee has been the chair of the IPCC since 8 October 2015, with the election of the new IPCC Bureau. Before this election, the IPCC was led by Vice-Chair Ismail El Gizouli, who was designated acting Chair after the resignation of Rajendra K. Pachauri in February 2015. The previous chairs were Rajendra K. Pachauri, elected in May 2002; Robert Watson in 1997; and Bert Bolin in 1988. The chair is assisted by an elected bureau including vice-chairs and working group co-chairs, and by a secretariat. The Panel itself is composed of representatives appointed by governments. Participation of delegates with appropriate expertise is encouraged. Plenary sessions of the IPCC and IPCC Working Groups are held at the level of government representatives. Non-Governmental and Intergovernmental Organizations admitted as observer organizations may also attend. Sessions of the Panel, IPCC Bureau, workshops, expert and lead authors meetings are by invitation only. About 500 people from 130 countries attended the 48th Session of the Panel in Incheon, Republic of Korea, in October 2018, including 290 government officials and 60 representatives of observer organizations. The opening ceremonies of sessions of the Panel and of Lead Author Meetings are open to media, but otherwise IPCC meetings are closed. IPCC Panel: Meets in plenary session about once a year. It controls the organization's structure, procedures, and work programme, and accepts and approves IPCC reports. The Panel is the IPCC corporate entity. Bureau: Elected by the Panel. Chaired by the Chair. 34 members include IPCC Vice-Chairs, Co-Chairs of Working Groups and the Task Force, and Vice-Chairs of the Working Groups. It provides guidance to the Panel on the scientific and technical aspects of its work. Working Groups: Each has two Co-Chairs, one from the developed and one from developing world, and a technical support unit. Sessions of the Working Group approve the Summary for Policymakers of special reports and working group contributions to an assessment report. Each Working Group has a Bureau comprising its Co-Chairs and Vice-Chairs, who are also members of the IPCC Bureau. Task Force Bureau: Comprises the two Co-Chairs, who are also members of the IPCC Bureau, and 12 members. Executive Committee: Comprises the Chair, IPCC Vice-Chairs and the Co-Chairs of the Working Groups and Task Force. Its role includes addressing urgent issues that arise between sessions of the Panel. The IPCC receives funding through the IPCC Trust Fund, established in 1989 by the United Nations Environment Programme (UNEP) and the World Meteorological Organization (WMO), Costs of the Secretary and of housing the secretariat are provided by the WMO, while UNEP meets the cost of the Depute Secretary. Annual cash contributions to the Trust Fund are made by the WMO, by UNEP, and by IPCC Members. Payments and their size are voluntary. The Panel is responsible for considering and adopting by consensus the annual budget. The organization is required to comply with the Financial Regulations and Rules of the WMO. The IPCC has published five comprehensive assessment reports reviewing the latest climate science, as well as a number of special reports on particular topics. These reports are prepared by teams of relevant researchers selected by the Bureau from government nominations. Expert reviewers from a wide range of governments, IPCC observer organizations and other organizations are invited at different stages to comment on various aspects of the drafts. The IPCC published its First Assessment Report (FAR) in 1990, a supplementary report in 1992, a Second Assessment Report (SAR) in 1995, a Third Assessment Report (TAR) in 2001, a Fourth Assessment Report (AR4) in 2007 and a Fifth Assessment Report (AR5) in 2014. The IPCC is currently preparing the Sixth Assessment Report (AR6), which will be completed in 2022. Each assessment report is in three volumes, corresponding to Working Groups I, II, and III. It is completed by a synthesis report that integrates the working group contributions and any special reports produced in that assessment cycle. The IPCC does not carry out research nor does it monitor climate related data. Lead authors of IPCC reports assess the available information about climate change based on published sources. According to IPCC guidelines, authors should give priority to peer-reviewed sources. Authors may refer to non-peer-reviewed sources (the "grey literature"), provided that they are of sufficient quality. Examples of non-peer-reviewed sources include model results, reports from government agencies and non-governmental organizations, and industry journals. Each subsequent IPCC report notes areas where the science has improved since the previous report and also notes areas where further research is required. Each chapter has a number of authors who are responsible for writing and ing the material. A chapter typically has two "coordinating lead authors", ten to fifteen "lead authors", and a somewhat larger number of "contributing authors". The coordinating lead authors are responsible for assembling the contributions of the other authors, ensuring that they meet stylistic and formatting requirements, and reporting to the Working Group chairs. Lead authors are responsible for writing sections of chapters. Contributing authors prepare text, graphs or data for inclusion by the lead authors. The IPCC First Assessment Report (FAR) was completed in 1990, and served as the basis of the UNFCCC. In 2001, 16 national science academies issued a joint statement on climate change. The joint statement was made by the Australian Academy of Science, the Royal Flemish Academy of Belgium for Science and the Arts, the Brazilian Academy of Sciences, the Royal Society of Canada, the Caribbean Academy of Sciences, the Chinese Academy of Sciences, the French Academy of Sciences, the German Academy of Natural Scientists Leopoldina, the Indian National Science Academy, the Indonesian Academy of Sciences, the Royal Irish Academy, Accademia Nazionale dei Lincei (Italy), the Academy of Sciences Malaysia, the Academy Council of the Royal Society of New Zealand, the Royal Swedish Academy of Sciences, and the Royal Society (UK). The statement, also published as an orial in the journal Science, stated "we support the [TAR's] conclusion that it is at least 90% certain that temperatures will continue to rise, with average global surface temperature projected to increase by between 1.4 and 5.8 °C above 1990 levels by 2100". The TAR has also been endorsed by the Canadian Foundation for Climate and Atmospheric Sciences, Canadian Meteorological and Oceanographic Society, and European Geosciences Union (refer to "Endorsements of the IPCC"). In addition to climate assessment reports, the IPCC publishes Special Reports on specific topics. The preparation and approval process for all IPCC Special Reports follows the same procedures as for IPCC Assessment Reports. In the year 2011 two IPCC Special Report were finalized, the Special Report on Renewable Energy Sources and Climate Change Mitigation (SRREN) and the Special Report on Managing Risks of Extreme Events and Disasters to Advance Climate Change Adaptation (SREX). Both Special Reports were requested by governments. The report was published in 2012. It assesses the effect that climate change has on the threat of natural disasters and how nations can better manage an expected change in the frequency of occurrence and intensity of severe weather patterns. It aims to become a resource for decision-makers to prepare more effectively for managing the risks of these events. A potentially important area for consideration is also the detection of trends in extreme events and the attribution of these trends to human influence. The full report, 594 pages in length, may be found here in PDF form. More than 80 authors, 19 review ors, and more than 100 contributing authors from all over the world contributed to the preparation of SREX. When the Paris Agreement was adopted, the UNFCCC invited the Intergovernmental Panel on Climate Change to write a special report on "How can humanity prevent the global temperature rise more than 1.5 degrees above pre-industrial level". The completed report, Special Report on Global Warming of 1.5 °C (SR15), was released on October 8, 2018. Its full title is "Global Warming of 1.5 °C, an IPCC special report on the impacts of global warming of 1.5 °C above pre-industrial levels and related global greenhouse gas emission pathways, in the context of strengthening the global response to the threat of climate change, sustainable development, and efforts to eradicate poverty". The finished report summarizes the findings of scientists, showing that maintaining a temperature rise to below 1.5 °C remains possible, but only through "rapid and far-reaching transitions in energy, land, urban and infrastructure..., and industrial systems". Meeting the Paris target of 1.5 °C (2.7 °F) is possible but would require "deep emissions reductions", "rapid", "far-reaching and unprecedented changes in all aspects of society". In order to achieve the 1.5 °C target, CO2 emissions must decline by 45% (relative to 2010 levels) by 2030, reaching net zero by around 2050. Deep reductions in non-CO2 emissions (such as nitrous oxide and methane) will also be required to limit warming to 1.5 °C. Under the pledges of the countries entering the Paris Accord, a sharp rise of 3.1 to 3.7 °C is still expected to occur by 2100. Holding this rise to 1.5 °C avoids the worst effects of a rise by even 2 °C. However, a warming of even 1.5 degrees will still result in large-scale drought, famine, heat stress, species die-off, loss of entire ecosystems, and loss of habitable land, throwing more than 100 Million into poverty. Effects will be most drastic in arid regions including the Middle East and the Sahel in Africa, where fresh water will remain in some areas following a 1.5 °C rise in temperatures but are expected to dry up completely if the rise reaches 2 °C. Since 2010 the IPCC has come under yet unparalleled public and political scrutiny. The global IPCC consensus approach has been challenged internally and externally with the 2009 Climatic Research Unit email controversy ("Climategate") an important (but not sole) threshold. It has been deemed an information monopoly with results for both the quality and the impact of the IPCC work as such. Former IPCC chairman Robert Watson said, regarding the Himalayan glaciers estimation, "The mistakes all appear to have gone in the direction of making it seem like climate change is more serious by overstating the impact. That is worrying. The IPCC needs to look at this trend in the errors and ask why it happened". Martin Parry, a climate expert who had been co-chair of the IPCC working group II, said that "What began with a single unfortunate error over Himalayan glaciers has become a clamour without substance" and the IPCC had investigated the other alleged mistakes, which were "generally unfounded and also marginal to the assessment". The original northern hemisphere hockey stick graph of Mann, Bradley & Hughes 1999, smoothed curve shown in blue with its uncertainty range in light blue, overlaid with green dots showing the 30-year global average of the PAGES 2k Consortium 2013 reconstruction. The red curve shows measured global mean temperature, according to HadCRUT4 data from 1850 to 2013. Figure 3.20 on p.175 of the IPCC Second Assessment Report. These studies were widely presented as demonstrating that the current warming period is exceptional in comparison to temperatures between 1000 and 1900, and the MBH99 based graph featured in publicity. Even at the draft stage, this finding was disputed by contrarians: in May 2000 Fred Singer's Science and Environmental Policy Project held a press event on Capitol Hill, Washington, D.C., featuring comments on the graph Wibjörn Karlén and Singer argued against the graph at a United States Senate Committee on Commerce, Science and Transportation hearing on 18 July 2000. 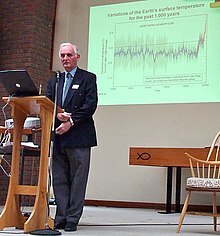 Contrarian John Lawrence Daly featured a modified version of the IPCC 1990 schematic, which he mis-identified as appearing in the IPCC 1995 report, and argued that "Overturning its own previous view in the 1995 report, the IPCC presented the 'Hockey Stick' as the new orthodoxy with hardly an apology or explanation for the abrupt U-turn since its 1995 report". Criticism of the MBH99 reconstruction in a review paper, which was quickly discred in the Soon and Baliunas controversy, was picked up by the Bush administration, and a Senate speech by US Republican senator James Inhofe alleged that "manmade global warming is the greatest hoax ever perpetrated on the American people". The data and methodology used to produce the "hockey stick graph" was criticized in papers by Stephen McIntyre and Ross McKitrick, and in turn the criticisms in these papers were examined by other studies and comprehensively refuted by Wahl & Ammann 2007, which showed errors in the methods used by McIntyre and McKitrick. Some critics have contended that the IPCC reports tend to be conservative by consistently underestimating the pace and impacts of global warming, and report only the "lowest common denominator" findings. Michael Oppenheimer, a long-time participant in the IPCC and coordinating lead author of the Fifth Assessment Report conceded in Science Magazine's State of the Planet 2008–2009 some limitations of the IPCC consensus approach and asks for concurring, smaller assessments of special problems instead of the large scale approach as in the previous IPCC assessment reports. It has become more important to provide a broader exploration of uncertainties. Others see as well mixed blessings of the drive for consensus within the IPCC process and ask to include dissenting or minority positions or to improve statements about uncertainties. The IPCC process on climate change and its efficiency and success has been compared with dealings with other environmental challenges (compare Ozone depletion and global warming). In case of the Ozone depletion, global regulation based on the Montreal Protocol has been successful. In case of Climate Change, the Kyoto Protocol failed. The Ozone case was used to assess the efficiency of the IPCC process. The lockstep situation of the IPCC is having built a broad science consensus while states and governments still follow different, if not opposing goals. The underlying linear model of policy-making of the more knowledge we have, the better the political response will be is being doubted. According to Sheldon Ungar's comparison with global warming, the actors in the ozone depletion case had a better understanding of scientific ignorance and uncertainties. The ozone case communicated to lay persons "with easy-to-understand bridging metaphors derived from the popular culture" and related to "immediate risks with everyday relevance", while the public opinion on climate change sees no imminent danger. The stepwise mitigation of the ozone layer challenge was based as well on successfully reducing regional burden sharing conflicts. In case of the IPCC conclusions and the failure of the Kyoto Protocol, varying regional cost-benefit analysis and burden-sharing conflicts with regard to the distribution of emission reductions remain an unsolved problem. In the UK, a report for a House of Lords committee asked to urge the IPCC to involve better assessments of costs and benefits of climate change, but the Stern Review, ordered by the UK government, made a stronger argument in favor to combat human-made climate change. The submission deadlines for the Fourth Assessment Report (AR4) differed for the reports of each Working Group. Deadlines for the Working Group I report were adjusted during the drafting and review process in order to ensure that reviewers had access to unpublished material being cited by the authors. The final deadline for cited publications was 24 July 2006. The final WG I report was released on 30 April 2007 and the final AR4 Synthesis Report was released on 17 November 2007.Rajendra Pachauri, the IPCC chair, admitted at the launch of this report that since the IPCC began work on it, scientists have recorded "much stronger trends in climate change", like the unforeseen dramatic melting of polar ice in the summer of 2007, and added, "that means you better start with intervention much earlier". The 2018 report What Lies Beneath by the Breakthrough - National Centre for Climate Restoration, with contributions from Kevin Anderson, James Hansen, Michael E. Mann, Michael Oppenheimer, Naomi Oreskes, Stefan Rahmstorf, Eric Rignot, Hans Joachim Schellnhuber, Kevin Trenberth, and others, urges the IPCC, the wider UNFCCC negotiations, and national policy makers to change their approach. The authors note, "We urgently require a reframing of scientific research within an existential risk-management framework." Papers and electronic files of certain working groups of the IPCC, including reviews and comments on drafts of their Assessment Reports, are archived at the Environmental Science and Public Policy Archives in the Harvard Library. International Council for Science (ICSU). "...the IPCC 4th Assessment Report represents the most comprehensive international scientific assessment ever conducted. This assessment reflects the current collective knowledge on the climate system, its evolution to date, and its anticipated future development". United States National Research Council. "The IPCC Third Assessment Report'] conclusion that most of the observed warming of the last 50 years is likely to have been due to the increase in greenhouse gas concentrations accurately reflects the current thinking of the scientific community on this issue". ^ "About the IPCC". Intergovernmental Panel on Climate Change. Retrieved 22 February 2019. ^ a b Weart, Spencer (December 2011). "International Cooperation: Democracy and Policy Advice (1980s)". The Discovery of Global Warming. American Institute of Physics. Retrieved 9 July 2012. ^ a b Introduction to the Convention, UNFCCC, Archived from the original on 8 January 2014, retrieved 27 January 2014 CS1 maint: BOT: original-url status unknown (link). ^ IPCC. "Principles Governing IPCC Work" (PDF). . Approved 1–3 October 1998, last amended 14–18 October 2013. Retrieved 22 February 2019. ^ a b c d IPCC. "Principles Governing IPCC Work" (PDF). . Approved 1–3 October 1998, last amended 14–18 October 2013. Retrieved 6 February 2015. ^ "Structure of the IPCC". Intergovernmental Panel on Climate Change. Retrieved 22 February 2019. ^ "The Nobel Peace Prize for 2007". Nobelprize.org. 12 October 2007. Archived from the original on 5 February 2010. Retrieved 25 June 2012. ^ "Decisions adopted by the 43rd Session of the Panel" (PDF). p. 11 decision 6. ^ "IPCC press release 24 February 2015: IPCC agrees on Acting Chair after R.K. Pachauri steps down" (PDF). IPCC. Retrieved 22 February 2019. ^ "16 Years of Scientific Assessment in Support of the Climate Convention" (PDF). ^ "Principles Governing IPCC Work" (PDF). IPCC. Retrieved 22 February 2019. ^ "Structure of the IPCC". IPCC. Retrieved 22 February 2019. ^ "Terms of Reference of the Bureau" (PDF). Retrieved 25 February 2019. ^ "Task Force on National Greenhouse Gas Inventories". Retrieved 25 February 2019. ^ "IPCC Executive Committee" (PDF). Retrieved 25 February 2019. ^ "Financial Procedures for the IPCC" (PDF). Retrieved 25 February 2019. ^ "The IPCC: Who Are They and Why Do Their Climate Reports Matter?". Union of Concerned Scientists. Retrieved 20 May 2016. ^ IPCC. "IPCC Factsheet: How does the IPCC review process work?" (PDF). Intergovernmental Panel on Climate Change. IPCC. Retrieved 18 January 2018. ^ "The IPCC: Who Are They and Why Do Their Climate Reports Matter?". Union of Concerned Scientists. Retrieved 29 September 2017. ^ "IPCC Factsheet: How does the IPCC select its authors?" (PDF). 30 August 2013. Retrieved 12 October 2018. ^ Working Group 2 Archived 3 March 2007 at the Wayback Machine, IPCC. ^ Working Group 3 Archived 8 July 2005 at the Wayback Machine, IPCC. ^ Synthesis Report Archived 17 June 2005 at the Wayback Machine, IPCC. ^ Ahmad, Q.K. ; et al., "Ch 2: Methods and Tools", Sec. 2.6.2. "Objective" and "Subjective" Probabilities are not Always Explicitly Distinguished, archived from the original on 4 May 2013 , in IPCC TAR WG2 2001. ^ a b c d e f g h "Summary for Policymakers", Table SPM-3, Question 9, archived from the original on 2 October 2012 , in IPCC TAR SYR 2001. ^ a b c Trenberth K. E. (May 2001), "Stronger Evidence of Human Influence on Climate: The 2001 IPCC Assessment" (PDF), Environment, Heldref, 43 (4) , p.11. ^ "Synthesis Report - Question 9". www.ipcc.ch. Retrieved 20 May 2016. ^ "Special Report on Renewable Energy Sources and Climate Change Mitigation – SRREN". Srren.ipcc-wg3.de. Archived from the original on 9 May 2011. Retrieved 25 June 2012. ^ a b c Special Report on Global Warming of 1.5°C (Report). Incheon, Republic of Korea: Intergovernmental Panel on Climate Change (IPCC). 7 October 2018. Retrieved 7 October 2018. ^ a b Headline Statements (PDF). Global Warming of 1.5 °C an IPCC special report on the impacts of global warming of 1.5 °C above pre-industrial levels and related global greenhouse gas emission pathways, in the context of strengthening the global response to the threat of climate change, sustainable development, and efforts to eradicate poverty (Report). IPCC. 8 October 2018. p. 3. Retrieved 8 October 2018. ^ Press release: Special Report on Global Warming of 1.5ºC (PDF) (Report). Incheon, Republic of Korea: Intergovernmental Panel on Climate Change (IPCC). 7 October 2018. Retrieved 7 October 2018. ^ Irfan, Umair (6 October 2018). "A major climate report will slam the door on wishful thinking". Vox. Retrieved 7 October 2018. ^ "Global Warming of 1.5 °C an IPCC special report on the impacts of global warming of 1.5 °C above pre-industrial levels and related global greenhouse gas emission pathways, in the context of strengthening the global response to the threat of climate change, sustainable development, and efforts to eradicate poverty". Intergovermental Panel on Climate change. Retrieved 7 October 2018. ^ Davenport, Coral (7 October 2018). "Major Climate Report Describes a Strong Risk of Crisis as Early as 2040". The New York Times. Retrieved 8 October 2018. Yohe, G.W. ; et al. "An Open Letter from Scientists in the United States on the Intergovernmental Panel on Climate Change and Errors Contained in the Fourth Assessment Report: Climate Change 2007". Archived from the original on 15 March 2010. . Note: According to Yohe et al. (2010), more than 250 scientists have signed the statement. ^ a b c Oppenheimer, Michael; O'Neill, Brian C.; Webster, Mort; Agrawal, Shardul (2007). "CLIMATE CHANGE, The Limits of Consensus". Science. 317 (5844): 1505–06. doi:10.1126/science.1144831. reprinted in Oppenheimer, Michael; O'Neill, Brian C.; Webster, Mort; Agrawal, Shardul (2008). "The limits of consensus". In Donald Kennedy and the Editors of Science (ed.). Science Magazine's State of the Planet 2008-2009: with a Special Section on Energy and Sustainability. ISBN 9781597264051. ^ Bagla, P. (29 January 2010). "Climate Science Leader Rajendra Pachauri Confronts the Critics". Science. 327 (5965): 510–511. Bibcode:2010Sci...327..510B. doi:10.1126/science.327.5965.510. PMID 20110473. ^ "Martin Parry". Retrieved 27 December 2015. ^ McIntyre, Stephen; McKitrick, Ross (2005). "Hockey sticks, principal components, and spurious significance" (PDF). Geophysical Research Letters. 32 (3): L03710. Bibcode:2005GeoRL..32.3710M. doi:10.1029/2004GL021750. Retrieved 31 October 2013. ^ Washington Post orial, 23 July 2005, Hunting Witches". ^ Bradley, Raymond S.; Hughes, Malcolm K.; Mann, Michael E. (2006). "Authors were clear about hockey-stick uncertainties". Nature. 442 (7103): 627. Bibcode:2006Natur.442..627B. doi:10.1038/442627b. PMID 16900179. ^ Scherer, Glenn (6 December 2012). "Climate Science Predictions Prove Too Conservative". Scientific American. Retrieved 11 September 2017. ^ McKibben, Bill (15 March 2007). "Warning on Warming". The New York Review of Books. 54 (4): 18. Bibcode:2004Natur.427..197S. doi:10.1038/427197a. Retrieved 21 February 2010. ^ "James Hansen's controversial sea level rise paper has now been published online". Washington Post. 2015. ^ "Climate change: The scientific basis". CTV Television Network. 5 February 2007. Archived from the original on 5 February 2007. Retrieved 24 July 2007. ^ Lemonick, Michael D. (1 November 2010). "Climate heretic: Judith Curry turns on her colleagues". Nature. doi:10.1038/news.2010.577. Retrieved 22 December 2010. ^ a b Grundmann, Reiner; Stehr, Nico (2010). "Climate Change: What Role for Sociology?". Current Sociology. 58 (6): 897–910. doi:10.1177/0011392110376031. ^ "Guidelines for inclusion of recent scientific literature in the Working Group I Fourth Assessment Report" (PDF). Archived from the original (PDF) on 26 February 2008. ^ Committee on Analysis of Global Change Assessments; Board on Atmospheric Sciences and Climate; Division of Earth and Life Sciences (2007). Analysis of Global Change Assessments: Lessons Learned. National Academies Press. ISBN 978-0-309-10485-2. Retrieved 24 July 2007. ^ Cicerone, Ralph J.; Barron, Eric J.; Dickinson, Robert E.; Fung, Inez Y.; Hansen, James E.; Karl, Thomas R.; Lindzen, Richard S.; McWilliams, James C.; Rowland, F. Sherwood; Sarachik, Edward S.; Wallace, John M.; Turekian, Vaughan C. (2001). "Assessing Progress in Climate Science". Climate Change Science: An Analysis of Some Key Questions. National Academies Press. Committee on the Science of Climate Change, Division on Earth and Life Studies, National Research Council. ISBN 978-0-309-07574-9. Retrieved 31 October 2013. ^ "Top scientists call for overhaul of UN climate panel". Brisbane Times. 10 February 2010. Retrieved 11 February 2010. ^ Gibson, Eloise (12 February 2010). "Climate panel facing calls to restructure". The New Zealand Herald. Retrieved 11 February 2010. ^ "The Scientific Understatement Of Climate Risks". Breakthrough Institute. 2018. ^ Tollefson, J. (2010). "Climate panel must adapt to survive". Nature. 467 (7311): 14. doi:10.1038/467014a. PMID 20811426. ^ "Joint statement by the Network of African Science Academies (NASAC)" (PDF). Network of African Science Academies. 2007. Archived from the original (PDF) on 10 September 2008. Retrieved 29 March 2008. ^ Zalasiewicz, Jan; et al. "Global warming: a perspective from earth history". Geological Society of London. Archived from the original on 23 February 2009. Retrieved 22 February 2010. Academia Brasileira de Ciéncias; et al. (16 May 2007), Sustainability, energy efficiency and climate protection. A joint-statement made by the science academies of the G8 nations and Brazil, China, India, Mexico and South Africa (the G8+5) (PDF), London, UK: Royal Society . Statement website. Academia Brasileira de Ciéncias; et al. (10 June 2008), Climate change adaptation and the transition to a low carbon society. A joint-statement made by the science academies of the G8 nations and Brazil, China, India, Mexico and South Africa (the G8+5) (PDF), London, UK: Royal Society . Statement website. Academia Brasileira de Ciéncias; et al. (1 May 2009), Climate change and the transformation of energy technologies for a low carbon future. A joint-statement made by the science academies of the G8 nations and Brazil, China, India, Mexico and South Africa (the G8+5) (PDF), London, UK: Royal Society . Statement website. Australian Academy of Science (August 2010), The Science of Climate Change: questions and answers, Canberra: Australian Academy of Science, ISBN 085847 286 4, archived from the original on 12 August 2013 . Low-resolution (2 Mb) or high-resolution PDF (25 Mb). IAC (1 October 2010), Climate Change Assessments, Review of the Processes & Procedures of the IPCC, InterAcademy Council (IAC), ISBN 978 90 6984 617 0, Archived from the original on 2 January 2014, retrieved 27 January 2014 CS1 maint: BOT: original-url status unknown (link). IPCC AR5 WG1 (2013), Stocker, T.F. ; et al. (eds. 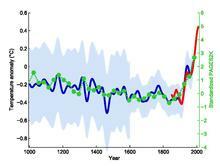 ), Climate Change 2013: The Physical Science Basis. Working Group 1 (WG1) Contribution to the Intergovernmental Panel on Climate Change (IPCC) 5th Assessment Report (AR5), Cambridge University Press . Climate Change 2013 Working Group 1 website. IPCC AR4 SYR (2007). Core Writing Team; Pachauri, R.K.; Reisinger, A. (eds.). Climate Change 2007: Synthesis Report (SYR). Contribution of Working Groups I, II and III to the Fourth Assessment Report (AR4) of the Intergovernmental Panel on Climate Change. Geneva, Switzerland: IPCC. ISBN 978-92-9169-122-7. .
IPCC AR4 WG3 (2007). Metz, B.; Davidson, O.R. ; Bosch, P.R. ; Dave, R.; Meyer, L.A. (eds.). Climate Change 2007: Mitigation of Climate Change. Contribution of Working Group III to the Fourth Assessment Report of the Intergovernmental Panel on Climate Change. Cambridge University Press. ISBN 978-0-521-88011-4 (pb: 978-0-521-70598-1). IPCC SRES (2000), Nakićenović, N.; Swart, R. (eds. ), Special Report on Emissions Scenarios: A special report of Working Group III of the Intergovernmental Panel on Climate Change, Cambridge University Press, ISBN 978-0-521-80081-5, archived from the original (book) on 3 February 2017 , 978-052180081-5 (pb: 0-521-80493-0, 978-052180493-6). Also published in English (html) (PDF) on the IPCC website. Summary for policymakers available in French, Russian, and Spanish. IPCC SAR WG1 (1996). Houghton, J.T. ; Meira Filho, L.G. ; Callander, B.A. ; Harris, N.; Kattenberg, A.; Maskell, K. (eds.). Climate Change 1995: The Science of Climate Change. Contribution of Working Group I to the Second Assessment Report of the Intergovernmental Panel on Climate Change. Cambridge University Press. ISBN 978-0-521-56433-5. (pb: 0-521-56436-0) pdf. ITGP (October 2010), THIRTY-SECOND SESSION OF THE IPCC, held in Busan, (IPCC-XXXII/INF. 4 (27.IX.2010)). REVIEW OF THE IPCC PROCESSES AND PROCEDURES: Notes on the Informal Task Group on Procedures (ITGP) (PDF), IPCC, Archived from the original on 6 July 2013, retrieved 1 February 2014 CS1 maint: BOT: original-url status unknown (link). Lambeck, K. (7 February 2007), Science Policy: On the edge of global calamity, Canberra: Australian Academy of Science, archived from the original on 6 August 2013 . Meinshausen, M.; et al. (November 2011), "The RCP greenhouse gas concentrations and their extensions from 1765 to 2300 (open access)", Climatic Change, 109 (1–2): 213–241, doi:10.1007/s10584-011-0156-z . NASAC (2007), Joint statement by the Network of African Science Academies (NASAC) to the G8 on sustainability, energy efficiency and climate change (PDF), Nairobi, Kenya: NASAC Secretariat, archived from the original (PDF) on 1 May 2014, retrieved 10 September 2013 . Statement website. PAGES 2k Consortium (21 April 2013), "Continental-scale temperature variability during the past two millennia" (PDF), Nature Geoscience, 6 (5): 339–346, Bibcode:2013NatGe...6..339P, doi:10.1038/ngeo1797 (78 researchers, corresponding author Darrell S. Kaufman). PBL; et al. (November 2009), News in climate science and exploring boundaries: A Policy brief on developments since the IPCC AR4 report in 2007. A report by the Netherlands Environmental Assessment Agency (PBL), Royal Netherlands Meteorological Institute (KNMI), and Wageningen University and Research Centre (WUR) (PDF), Bilthoven, Netherlands: PBL, archived from the original (PDF) on 1 May 2014 . Report website. Stern, N. (2006). "Stern Review Report on the Economics of Climate Change (pre-publication ion)". London, UK: HM Treasury. Archived from the original on 7 April 2010. Retrieved 8 March 2017. Agrawala, S. (August 1998). "Context and Early Origins of the Intergovernmental Panel on Climate Change". Climatic Change. 39 (4): 605–620. doi:10.1023/A:1005315532386. Agrawala, S. (August 1998). "Structural and Process History of the Intergovernmental Panel on Climate Change". Climatic Change. 39 (4): 621–642. doi:10.1023/A:1005312331477. "IPCC – 16 years of Scientific Assessment in Support of the Climate Convention" (PDF). (618 KB). "Papers of the Intergovernmental Panel on Climate Change". Harvard College Library. Archived from the original on 27 April 2010. Retrieved 14 May 2010. — The collection of drafts, review-comments and other documents relating to the work of the Working Group I of the Assessment Report 4.